Marta Andreasen, UKIP's Treasurer and a UKIP MEP for the South West euroregion, has resigned from her post as Treasurer after a falling out with Paul Nuttall, the party chairman. Andreasen and Nuttall have apparently had a disagreement over the decision to double the salary of a party official. The NEC agreed to the salary increase and Nuttall awarded it in defiance of Andreasen's objections. This is a tricky one because ultimately such decisions are down to the Chairman and the NEC but the money man (or woman in this case) generally gets a big say in the matter because there's money involved. I suspect there's more to it than a disagreement over money but I don't necessarily see this as a bad thing. It was positive to have Marta Andreasen as the party Treasurer with her sleaze-busting credentials but I commented at the time of the announcement she was standing as an MEP that I didn't see how she would be able to do the job of an MEP and the job of a Treasurer. Now she can concentrate on being an MEP and we can get a full-time Treasurer. 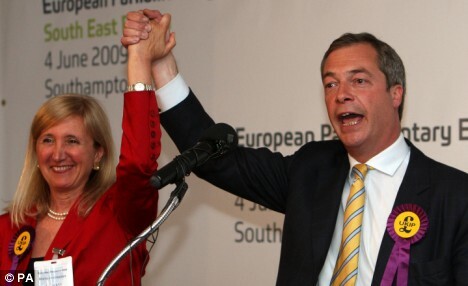 UKIP's enemies (of which there are many, especially in the LibLabCon-controlled media) will try to paint this as a damning endictment of UKIP and the party's finances but it's clear that Marta Andreasen has resigned as Treasurer, not from the party and because of a disagreement over money, not because she has uncovered fraud. So who had their salary doubled. Was this a reward for something? For Marta to resign over this when so much depended on UKIP's financial probity leads one to ask the question. Paul needs to backtrack on this and eat humble pie. Not happy about this ,Nuttall needs to explain why it was so important to do this. We have lost an individual who added a lot to the reputation of the Party which has had enough dirt thrown at it over the years. I agree that it's a blow to lose such a competent, high profile and feared (by corrupt europhiles) Treasurer but keep this in perspective, she's only resigned as Treasurer, not from the party or as an MEP. And at least now she can concentrate on one job rather than two. Without knowing the background - who the employee in question is, how much they're getting paid and why Nuttall thinks they deserved the increase - it's impossible to tell whether the decision is right or wrong. If Marta thought there was something amiss in UKIP she wouldn't still be with us. Rumours abound that she won't be for long as a result of this. She happily goes to the press so let's hope she doesn't leave the party completely. I heard a similar rumour as well Bob but my source tells me that nobody knows yet, not even our illustrious leaders.